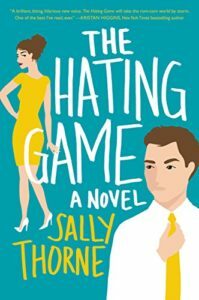 I read The Hating Game because A) Malin said she liked it and Malin has impeccable taste and B) she compared it to Act Like It, which I absolutely adored. Honestly, I was smack dab in the middle of The Descent by Tim Johnston and just could not get into it, so as soon as I saw this recommendation, I dropped everything to read it. I’m so glad I did, it was one of those “have to finish this immediately” books but, oh, it was also an “I’m so sad this is over” book because what do I read now, I ask you? WHAT? The Hating Game tells the story of two people who fell in True Hate as soon as they met each other. Lucy and Josh are assistants to co-CEOs and are as different as night and day. They only met because their two companies had to merge in order to avoid shutting down. Lucy is a teensy thing with bright, bold lipstick and fashion choices, she’s always quick with a joke and is extremely well-liked by everyone. Except Josh. Josh is a quiet, sullen, stoic type, who never has a kind thing to say to Lucy and who is generally feared by the entire company. They spend their days waging quiet (and not-so-quiet) war with one another, with battles including the Staring Game, the How You Doing Game, and, my favorite, the “I’m Keeping an HR File On You” game. When a new position within the company is announced that both Lucy and Josh covet, they’re ready to wage a different kind of war with one another, one with actual stakes. Neither is quite prepared for this, as their feelings have started to change and they’re beginning to grow closer. As the novel progresses, they take a predictable turn toward not-so-hatey, but even though it’s predictable, that doesn’t make it any less delightful. There’s something so comforting about romance novels, whether they be old timey or modern. My favorites are the ones where the two main characters absolutely despise one another and grow fonder toward the other against their will (thanks, Jane Austen), so of course this one was right up my alley. I highly, highly recommend if you’re looking for a light, swoonworthy, romance that has some genuine cheer out loud moments. Just make sure you block off an afternoon so you can finish it all in one go. Share the post "Burr, you disgust me"
I am right this very minute trying to decide what to download for a very long flight this weekend, and this is now bumped to the top of the list! It made my heart so happy! I hope you love it. I already want to read it again (though, not really, I want to read a similar book that makes me feel the exact same way and I’ve never figured out how to make that happen). I feel like I have Hamilton running on a continuous loop in my head. Like. All the time. Ugghhhhh. You guys are trying to kill me with this and Act Like It. I DON’T HAVE TIME FOR THIS!!! YOU DO! You can read them SO FAST. Just set aside, like, a day. Agreed. This is an easy book to squish in to the book schedule. I read it on a plane the other day and was done before it landed. It was lovely and perfect and I thank you for your review!! Having now re-read Act Like It (still excellent, stupid Will and the collapsing theatre still make it not a full 5-star), I may actually end up re-reading this again real soon. I really liked it, and am so glad I follow a lot of romance review sites, so I discovered it early. The book could absolutely have had more *funky bass line*, though. Your dedication to Hamilton, and finding an appropriate quote for all your reviews is amazeboobs. I was surprised by how much I liked this and Act Like It. And I’m pretty sure I have you to thank for Act Like It, too, so thank you! It’s getting harder to find quotes that I haven’t used yet. I had to make a spreadsheet.